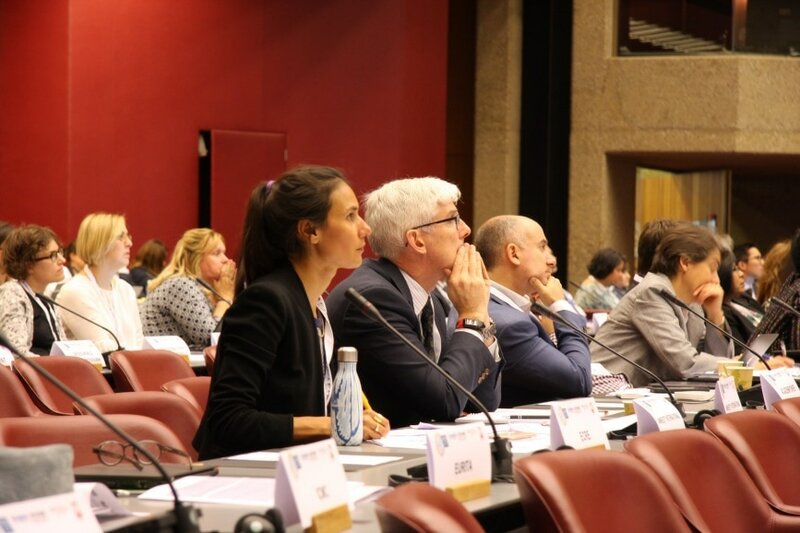 The Annual Tripartite Consultations on Resettlement (ATCR) is the most important international conference on the topic of resettlement and humanitarian acceptance of refugees. It has been held every year since 1995 in Geneva. Those taking part include representatives of state and civil society groups. The committee chair changes every year. Since July 13, 2017 Germany had been the chair of the conference. The German Caritas Association served as the civil society co-chair. 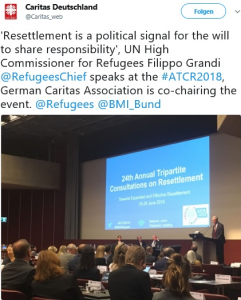 Together with the Ministry for the Interior and the UNHRC, the German Caritas Association was responsible for the organization of the ATCR on the theme of “Towards Expanded and Effective Resettlement” on June 25th and 26th as well as the Working Group on Resettlement (WGR) back in February 2018. 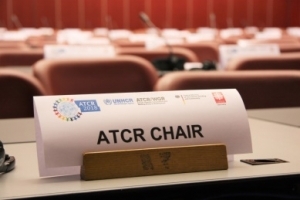 Around 260 representatives from countries, NGOs and international organizations came together at the ATCR to discuss current issues and work out collective strategies. 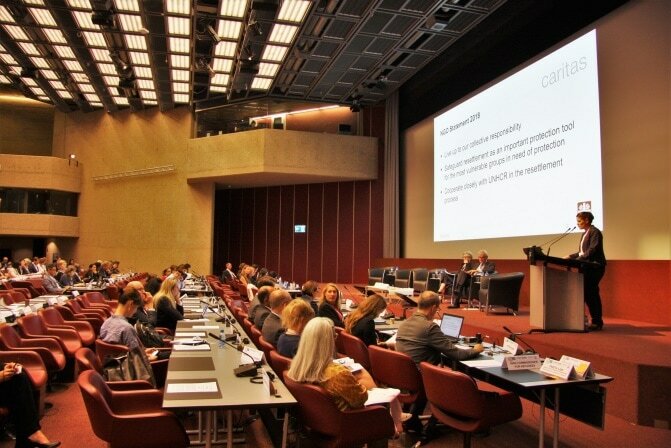 To begin the conference the German Caritas Association as co-chair presented an NGO statement, which was prepared by the international NGO community in anticipation of the ATCR. The statement, critical of recent developments, reinforces the importance of resettlement and calls on countries to accept the responsibility. The main theme this year was the reduction of places set aside by various countries. The UN High Commissioner for Refugees, Filippo Grandi, pointed out that declining acceptance quotas contrasted the growing need. He emphasized that resettlement is an important instrument and that more states should be convinced to take part in. Since 2016, there are 35 countries that accept resettlement refugees. Among those, two thirds of the refugees were received by only five of those countries. 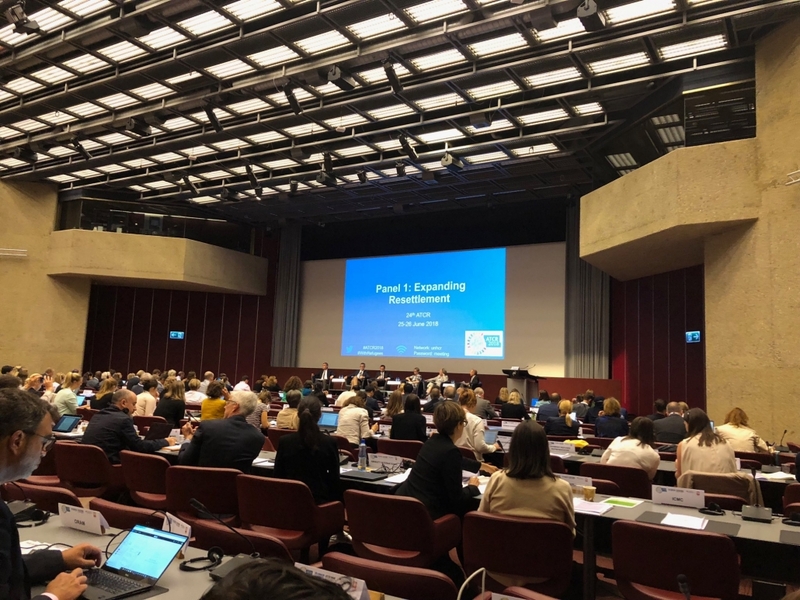 Pursuant to the Projected Global Resettlement Needs Report for 2019, which the UNHCR traditionally presents at the ATCR, the worldwide resettlement need for 2019 rose from 1.2 million to 1.4 million in the past year. Syrian Refugees remain for the 3rd year in a row the group with the highest relocation need, followed by refugees from the Democratic Republic of Congo and South Sudan. Because of continuing crises, the greatest need in general remains on the African continent. Especially those incarcerated in Libya and Niger must be evacuated, something that must not be forgotten. In the last seven months, 1600 people have already been evacuated, but among them only 174 have been resettled. The Deputy High Commissioner Volker Türk advocated in his report for political strength in leadership, saying that the use of resettlement to protect vulnerable groups is a collective responsibility. He emphasized the necessity of political statements to support this responsibility. Overall, many NGOs combat the negative perceptions and lacking public support for resettlement. Clear information and statements from the political side are needed. The exhibition of successful resettlement practices was well received at the conference. The cooperation between NGOs and research institutes (think tanks) will presumably become more important for these successes. At the end of the conference the position of Chair was passed to the United Kingdom, which will preside over the conference next year. The conference provided updates on Twitter under the hashtag #ATCR2018.